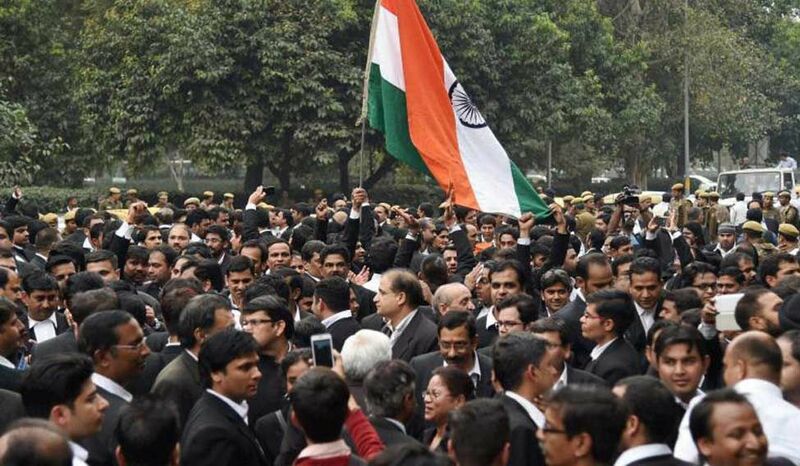 Law Commission of India had submitted the 266th report, “The Advocates Act 1961 (Regulation of Legal Profession)”, it suggest some amendment in the act. This was first deal in the case of Mahipal Singh Rana v. State of Uttar Pradesh. In this it was observed that there is urgent need to review the provisions of the Advocates Act 1961 which deal with the regulatory mechanism for the legal profession. The Law Commission of India and Government of India. The Law Commission on 24th March 2017 had submitted the draft of the Advocate Amendment Bill 2017. Lawyer’s Strike- The District Judge shall constitute an Advocates Grievance Redressal Committee which will be headed by a Judicial Officer. He will deal with the day to day routine matter like issue and grievances arise in the smooth working of the advocates. The High Courts will issue a circular under article 235 of the Constitution of India providing for redressal of grievances of the Advocates which would help in improving their efficiency. If there some grievance against the Judicial Officer than the Bar may rise the grievance before the Chief Justice of the state. Propriety of performing public function by convicted persons-There shall be substitution of section 24A and 26A with the new provision whose objective is undesirability of convicted persons being allowed to perform important public functions. Fake Lawyers and verification- There shall be a specific rule making power for Bar Council of India to make rules for verification of certificates of Advocates and for periodical verification of antecedents, conduct, place of practice of Advocates and to make a data based web-portal of all the advocates. Legal Education- It should be structured in a manner where the Bar Council of India along with legal academics may endeavor to innovate, experiment and globally. A balance should be maintained in order to change the entire fabric of legal education system in India, keeping in mind the necessity of globalization. Pre-enrolment Training of Advocates– There is introduction of the section 7(1) which says that there shall be pre-enrolment training and apprenticeship before the induction of a person as an advocate. Prospects of Foreign Law Firms and Lawyers in India– There shall be provision in the Advocate Act which enable the Bar Council of India to frame rules to recognize and register foreign law firms and lawyers in India as when a decision is taken in this regard. Need for Defining Misconduct– They have defined Professional Misconduct. In the section 24A there is definition of the misconduct. Misconduct includes an act of an advocate whose conduct is found to be in breach of or non-observance of the standard of professional conduct or etiquette required to be observed by the advocate or forbidden act or an unlawful behavior or disgraceful and dishonorable conduct or neglect or working diligently and criminal breach of trust or any of his conduct incurring disqualification. Need of Reviewing Regulatory Mechanism- The commission recommended that comprehensive amendment should be brought forth in the Advocates Act not only keeping in view the present requirements but such other requirements that may arise in future for the better management and regulation of the legal profession. This amendment bill of 2017 would be bringing good changes in the working procedure of the Advocates of India. In the education sector of the regarding to legal education. Now it will easy to conduct the problems of the Advocate like the most common problem is that they have hearing in different courts o the same day. BALLB, Energy Laws, COLS UPES. Criminal Appeal no. 63 of 2006. Ashok KM, Law Commission Suggest Drastic changes in Advocate Act, (25 March, 2017, 12:00pm) http://www.livelaw.in/breaking-law-commission-suggests-drastic-changes-advocates-act/.